In the last two years, coal consumption has slowed to its lowest level in two decades, even with the economy growing at a steamy 7 per cent annual pace. 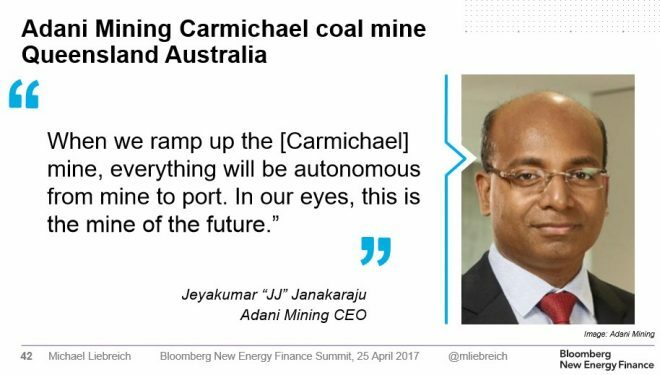 The developments come as Adani pushes ahead with its massive $16.5 billion Carmichael coal mine in Queensland, from where it plans to ship 60 million tonnes of coal a year to India. A similar correction is under way in China, where officials and analysts have had to walk back earlier predictions that its annual coal needs would peak in 2030. Instead, the International Energy Agency says China’s coal use — and emissions — topped out in 2013. In those 10 years, improved battery technology that would enable weather- and time-dependent solar and wind power to serve as around-the-clock power sources could help reduce coal use further, according to Mathur, of The Energy and Research Institute. Battery prices have already fallen by two-thirds, he said. If they drop by another 50 per cent in the next decade, solar power with battery storage will be cheaper than coal-fired power. Blind Freddy can see that the Adani Carmichael Project risks becoming an unviable stranded asset, and Australian taxpayers risk losing their dough by lending $1 billion for the project. Worse, the subsidised project would flood the world with more cheap coal, thus depressing its price, increasing global consumption (and exacerbating climate change), as well as putting non-subsidised mines in NSW and QLD out of business, resulting in job losses. Whereas Adani’s own hand-picked economic expert, Jerome Fahrer from ACIL Allen consulting, told the Queensland Land Court that only 1,464 full-time equivalent jobs would be created by the project. These piss weak job gains must also be offset by the job losses that would occur among other Queensland and New South Wales coal mines. In short, there are far better ways to use scarce taxpayer funds than on this wasteful white elephant. Australia must withdraw its concessional loan pronto and tell Adani that if it wants the Carmichael mine, then it must fund it entirely itself and bear the risk, as well as pay the correct amount of royalties to the Queensland Government. Indeed. Coal is just coal. It didn’t pick its colour. I hope Adani isn’t doomed. It’s a great opportunity for everyone in on it to maximise their profits from a great resource that Australia has a competitive advantage in. I know you don’t like shares, but did you have a link to that IPO re coal-powered cars you were talking about the other day? 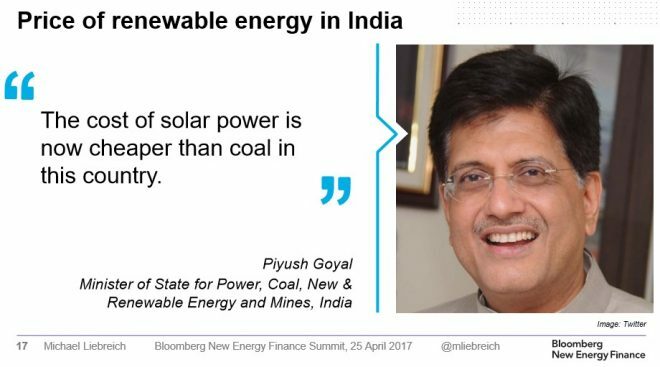 India cancelled 14 Gigawatt of new coal-fired powerplants because of this. Australian politicians need to stop listening to the usual vested interests and start planning ahead for the future. Oh, that’s right – that would need politicians who aren’t corrupted and independent institutions with decent research and analyses capabilities to put the undeniable facts in their face and on the frontpage. … and while I was looking for the link above I found that China had already cancelled plans for 54 Gigawatts worth of new coal-fired power stations (103) earlier this year. How many genuine punches can these clowns take? In a reasonable world you would’ve seen them throw the towel in by now, surely? Unless of course, they’re a pack of righteously entitled psychopaths talking each other up in their enclosed echo chamber…… Cultist! Correct: Guys Adani dont give a rats arse about the coal. All they are interested in is getting back the $500 million they blew when they were suckered into buying those stranded coal leases from snake oil salesman peter bond. This is all about saving face and making Strayans pay for indian stupidity. “well tried” indeed. So, consider the Carmichael port “well tried” and walk away. Nth QLD marginal electorates don’t care, they want that sweet sweet socialism while everyone else braves the seas of global market forces.